1. First, we will make our template. Measure the circumference of both the top and bottom of the lamp shade. Record both measurements. Next, measure the length of the lamp shade (I will refer to this as the length line). 4. 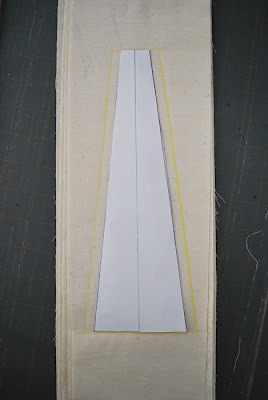 Using your template, cut out the desired amount of fabric strips (not the muslin). 5. Arrange the strips on the lamp shade. Find a fabric sequence that is pleasing to your eyes. 6. One by one, peel of the strips and apply fabric glue to the wrong side of the fabric. It is very important that the glue is waterbased and non flammable or else you just may have to buy yourself a new house along with a new lamp shade. 7. 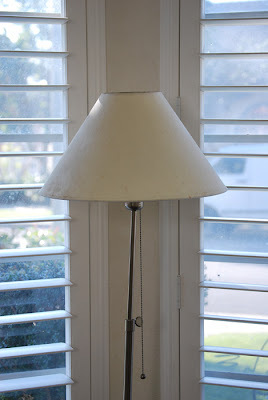 Lay the fabric strip on to the lamp shade. Smooth out any bumps or bubbles. Repeat with the remaining strips of fabric. If you find that the strips don't line up perfectly, don't fret, the muslin strips will hide a multitude of sins. I know what your thinking... "What did I let Jamie talk me into?" A happy lamp shade! Trust me. I'm a professional.... sort of.... at least in Prettydittyville I am. 8. Now for the muslin strips. Lay your template on top of your muslin. Add a 1/4" seam allowance to each side of the muslin (see pic below). * Note I did not add a 1/4" seam allowance to the top or bottom of the template. Just the sides. Cut double the amount of muslin strips as you did for the print strips. For example, if you cut 12 print strips then you should cut 24 muslin strips. 9. Once all of the muslin pieces are cut, you may begin to sew them together. Place two muslin pieces together, one on top of the other. 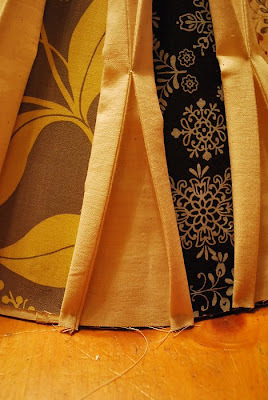 If you are working with fabric that has a right and a wrong side, then you will want right sides together. 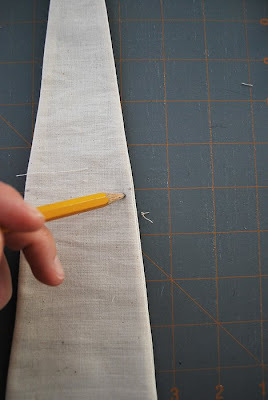 With a 1/4" seam allowance, sew the lengthwise seams on both sides of your muslin strip. * Note - Do not sew the top or bottom of the strip, just the sides. 10. Turn your strip right side out and press. A little wonky, but when it's folded it won't matter. 11. 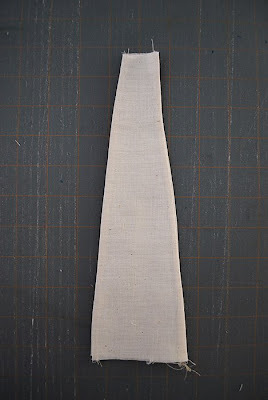 Find the mid point of your muslin strip and make a mark on the side. This mark should be light and will serve as a reference for where the fold should be. 12. 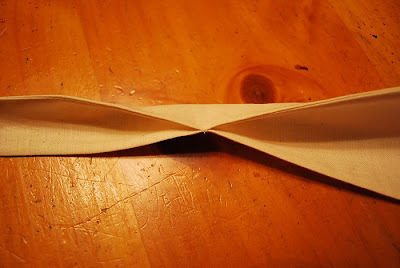 Fold the muslin strip in half lengthwise. With matching thread, hand sew the fold close by making a little tack where the mark is. 13. Place your muslin strip between two printed strips. 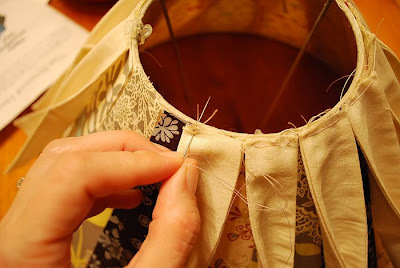 With a needle and thread, baste the top of the muslin piece to the shade. Do not cut the thread. 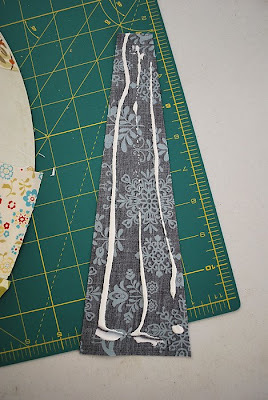 Place another muslin piece between the next two printed pieces and baste with the same thread. Repeat with all muslin pieces. 14. Repeat step 13 for the bottom portion of the muslin strips. 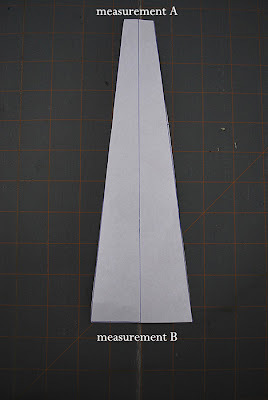 However, this time fold the bottom corners in a 1/4" (see pic). 15. 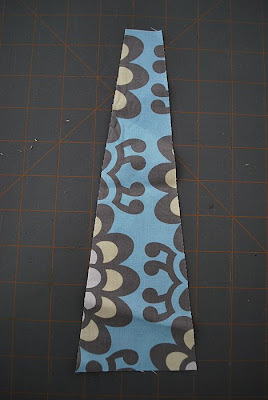 Hand stitch the bias tape to the top and bottom of the shade. 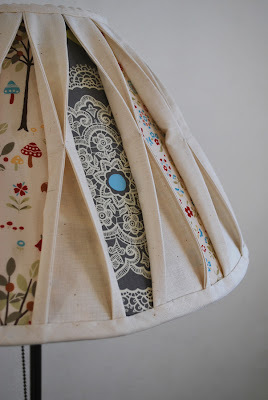 Be sure to place the edge of the shade in the bias tape and poke through both the fabric and shade (use a thimble) when sewing. I used a beige thread and a blind hem stitch. However, you can have fun with this part. One idea could be the use of embroidery thread in a popping color and a blanket stitch to show it off. And voila! A happy shade made by you. 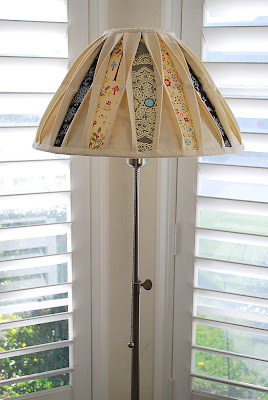 If you make a lamp shade, please join the Pretty Ditty Show and Tell flickr group and show what you have created. OH WOW Jamie i love this peek-a-boo lamp shade makeover! I'm actually looking around my work space and room to see which lamp shades need a makeover! I love it so much! Thank you thank you for sharing! I'm also very very happy to know that your putting up the dolls kits for purchase in your shop! I would love to buy one or two just for me altho im not a very good painter and don't think i can paint a face as beautiful as your dolls. But i would love to try! Have a merry happy day! That is the cutest lampshade! I can't wait to use the tutorial. Jacqueline - I'm really excited about the kits as well. As for painting the face, it's all about the brushes. Well made little brushes are what works best. What a great idea! Very inspired. I love that you can take something old and bring it back to life. A lamp to treasure with so much more meaning. Uber Cool!. If I get brave, I'll take a stab at it with an old table lamp that I just can't bring myself to toss. If you had to say what level of sewing skills are necessary, what would it be? Really any sewing level can make it. It's just a matter of following directions and hopefully well explained directions. wow that came out so great!! Wow, that lamp shade is beautiful. It does look like it is out of the Anthro catalog. Thank you! Beautiful!! Quilters are gonna go crazy over this idea. It's awesome. I'm going to have to find a lamp I can makeover soon. Thanks for sharing. OMG I love it - It looks fantastic. Wow! This is awesome! I would love to photo link to it if you didn't mind. Rachel - I don't mind at all =) Thank you. amazing. once again, i am extremely jealous of your fabric craftiness. what an outstanding idea! and execution! and tutorial! Beautiful work. The shade and lamp look wonderful. this is so beautiful, well done on a great tute. It is really beautiful! thanks for sharing the tutorial! What a simply and lovely idea. I love the different fabrics so that by turning it you could have a different shade. that one is absolutely beautiful! I like it very much! thank you for sharing! Thanks for sharing this fantastic tutorial! That is so creative and beautiful! This is great and so creative. LOVE it!!! This is so fab!!! your so creative i can't stand it. I said it to wife "honey for what buy new ones, when I can search for information and do it ourself" and I'm right, finally my son could have the Thor lamp shade he want, and I the Cheap Viagra that I want. That's really pretty. You have given the lamp shade a whole new personality. Thanks for sharing your ideas, I got a lot from this article, and it was a real eye opener for me. You are talented, keep writing! I'll bookmark your web site and take the feeds also…I am happy to find so many useful information here in the post. Now I realize that many people in Israel are darker skinned to begin with, but on that beach I was far more concerned with the countries skin cancer rates than with the coming rapture. great blog and post and very creative too, amazing what can be made with a bit of imagination. Graet writing skills really awesome effort done by the autjor i really appreciate it. Your Peek-a-boo lamps is very nice.I will also try it at my home. Excellent post. I really appreciate the work done in this post. Good collections. This blog seems to be quite interesting to make a look into it. Great art concept involved. like your blog design and written style. Thanks for sharing these information. 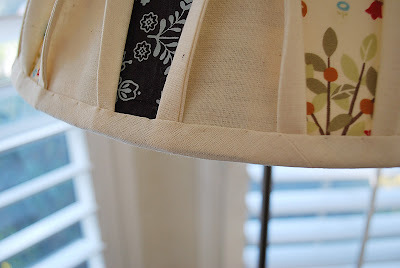 Re-do your plain lampshade with this peek-a-boo lampshade makeover, a free sewing tutorial for home decorating. Thanks for sharing these info with us! I like your blog and themes & colors. Aha!! that's a really good post.. Nice blog i like it, I will definitely be visiting again. Its amazing, looking at the time and effort you put into your blog and detailed information you provide. Hey there, You have done a fantastic job. I will definitely digg it and personally suggest to my friends. I'm sure they will be benefited from this website. It's Great...!! I have got lot of information to read this topic..It's very essential me..
You have more information about this blog.. please share me more.. Thanks.. It's great to see a blog of this quality. I learned a lot of new things and I'm looking forward to see more like this. Normally I don't read post on blogs, however I wish to say that this write-up very forced me to take a look at and do so! Your writing style has been surprised me. Thank you, quite great article. Quit Smoking Tips. Excellent write-up, keep it up! Wow...what a lovely creation...thanks for sharing. This is so very cool! Thanks. When I first looked at I thought there was a template for the cut out shape, but when I went back I couldn't find it. Was I just dreaming? Awesome... I appreciate that you have shared the process of making lamp shade, spreading knowledge what you have is act of high valence people. This will increase practical knowledge of lot of people. This is adorable and you are so clever! I can't wait to try this. I have two matching lamps just waiting for a new look. Thank you for sharing! Thank you so much for the inspiration to redo a lamp shade. I was about to throw one out & look for a new one, but making one with your idea is the best. It can be customized to colors you like. Appreciate you sharing your ideas. Just found this tutorial on AllFreeSewing site. Yahoo, I now know what to do with my small table top lamp shade that is separating from the top of the wire frame. (Something to do with cats and wind knocking it on the floor too many times.) This is gorgeous! Thank you. I was WONDERING why you would place a strip of muslin over one of your decorative strips - hiding it. Then I RE-read the instructions and you place it on the seams. DUH TO ME. Now I am in serious need of an ugly lampshade! I was so excited to come across this tutorial! I have been hunting for a new lampshade in the shape you showed and I have had no luck. 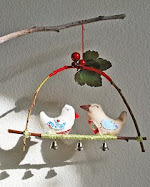 My husband and I have thought about trying to make a new one, but this idea is great and I think we will give it a try. Thanks so much! Great job with the lamp. Love it. 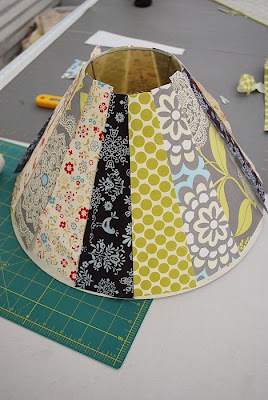 Thanks for sharing a very interesting article about Peek-a-boo lamp shade makeover/tutorial. This is useful information for online blog review readers. Keep it up such a nice posting like this.